I was never a huge fan of card games, but the past few years changed that. As I learned to play the basics, I then moved on to try the longer, more complex games. During my Uni years, Poker was one of them. Now for someone who is living in an incredibly small flat (thankfully only for another two and a half weeks), it's pretty impossible to play board or card games, so I started sourcing out the same games online and on my Xbox 360 instead. 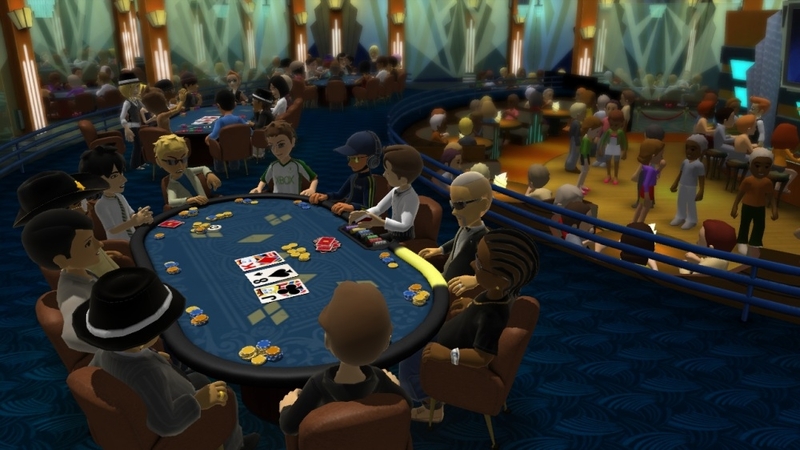 This is where I found Full House Poker. 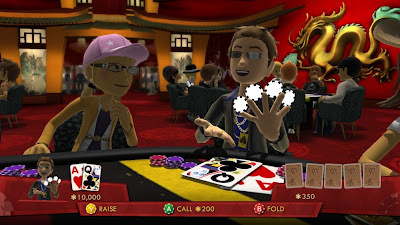 Essentially the same game, but with the added fun of seeing the Xbox Avatar version of you pulling it's best Poker face (believe me, my virtual counterparts is much better than my own). 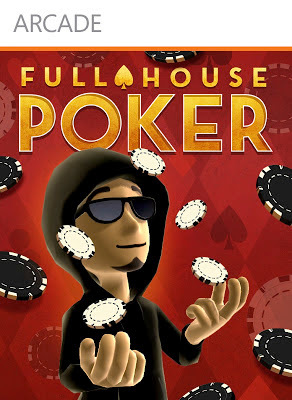 There can be plenty of rules for Poker, but thankfully Full House Poker has a helpful text and video section to guide you along the way. Once you have made yourself aware of the rules, it's time to try the actual game. Whilst the rules definitely help you to get to grips with the gameplay, it's not completely plain sailing. AI opponents can be rather ruthless, so the first few games may seem a little tricky. However, Full House Poker rewards those for playing well, even when your chip stack is dwindling. However, unfortunately the AI players can often take the 'all or nothing' approach, taking huge risks that will more often than not see them fold before the end. Online play allows you to play against fellow real life players of varying difficulties if the AI becomes a little unbearable though. In general though, AI opponents can be fun, albeit a little challenging at times. For those still struggling to remember what types of hands will be to your advantage, luckily there is a handy tip. Press the left bumper to see a list of possible hands in order of their strength. Using this feature stops you from throwing in a hand at random, just because you are unsure of what to play next. Whilst Full House Poker is a great alternative to playing with actual playing cards and poker chips, it's only winning you virtual money. However, some of you enjoy playing numbers to win cash. 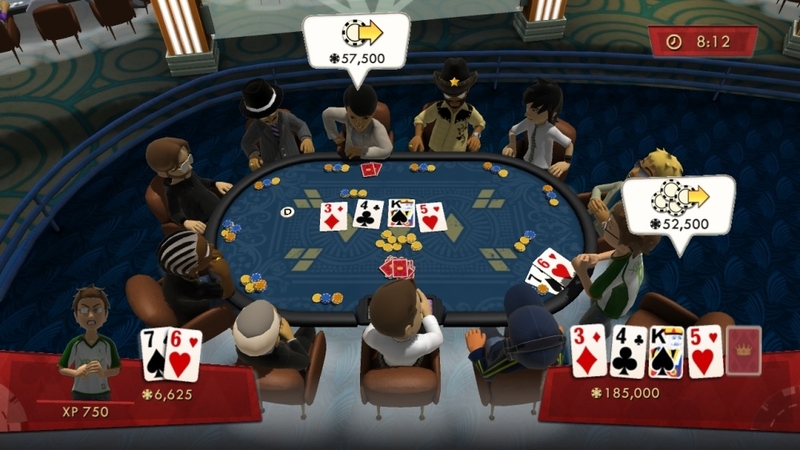 For example, there are a great range of betting games from Paddypower, with a whole variety of Poker and other card games available to try out. Overall, Full House Poker is a lot of fun. Whilst it may seem a little harsh for the most part, this version of Poker does reward players from any skill-set, allowing even for the amateur players who are still learning the ropes. Seeing your avatar play Poker is also a lot more fun than playing as a random computer generated player. Through their expressions, these avatars bring a little more fun to the proceedings. So if you are looking for a fun card game on Xbox Live Arcade, Full House Poker is definitely recommended.